Downtown Wheeling as viewed from above 22nd Street in 2012. Wheeling is a city in the State of West Virginia and is the county seat of Ohio County, but also has some subdivisions in Marshall County. Located along the Ohio River in the foothills of the Appalachian Mountains, Wheeling was originally a settlement in the British Colony of Virginia and later an important city in the Commonwealth of Virginia. Wheeling was the first state capital of West Virginia. Thanks to its location along major transportation routes, including the Ohio River, National Road, and the B&O Railroad, Wheeling became a manufacturing center in the late Nineteenth Century. After experiencing the closing of industry and substantial population loss following World War II, Wheeling's major industries now include healthcare, education, law & legal services, entertainment & tourism, and energy. Wheeling is the county seat of Ohio County and the principal city of the Wheeling Metropolitan Statistical Area. As of the 2010 census, the Wheeling, WV MSA had a population of 147,950 and the city had a population of 28,486. The origins of the name "Wheeling" are disputed. One of the more credible explanations is that the word comes from the Lenni-Lenape phrase wih link, which meant "place of the head." This supposedly referred to a white settler who was scalped and decapitated. His severed head was displayed at the confluence of Wheeling Creek and the Ohio River. The area had been inhabited by Native Americans for thousands of years. In the 17th century, the Iroquois from present-day New York state conquered the upper Ohio Valley, pushing out other tribes and maintaining the area as their hunting ground. Originally explored by the French, Wheeling still has a lead plate remnant buried by the explorer Céloron de Blainville in 1749 at the mouth of Wheeling Creek to mark their claim. Later, Christopher Gist and George Washington surveyed the land, in 1751 and 1770, respectively. During the fall of 1769, Ebenezer Zane explored the Wheeling area and established claim to the land via "tomahawk rights." (This process meant to deaden a few trees near the head of a spring, and mark the bark with the initials of the name of the person who made the claim). He returned the following spring with his wife Elizabeth and his younger brothers, Jonathan and Silas; they established the first permanent European settlement in the Wheeling area, naming it Zanesburg. Other families joined the settlement, including the Shepherds (see Monument Place), the Wetzels, and the McCollochs (see McColloch's Leap). In 1787, the United States gave Virginia this portion of lands west of the Appalachians, and some to Pennsylvania at its western edge, to settle their claims. By the Northwest Ordinance that year, it established the Northwest Territory to cover other lands north of the Ohio River and west to the Mississippi River. Settlers began to move into new areas along the Ohio. In 1793, Ebenezer Zane divided the town into lots, and Wheeling was officially established as a town in 1795 by legislative enactment. The town was incorporated January 16, 1805. On March 11, 1836, the town of Wheeling was incorporated into the city of Wheeling. By an act of the Virginia General Assembly on December 27, 1797, Wheeling was named the county seat of Ohio County. Originally dubbed Fort Fincastle in 1774, the fort was later renamed Fort Henry in honor of Virginia's American governor, Patrick Henry. In 1777, Native Americans of the Shawnee, Wyandot and Mingo tribes joined to attack pioneer settlements along the upper Ohio River, which were illegal according to the Crown's Proclamation of 1763. They hoped an alliance with the British would drive the colonial settlers out of their territory. Local men, later joined by recruits from Fort Shepherd (in Elm Grove) and Fort Holliday, defended the fort. The native force burned the surrounding cabins and destroyed livestock. During the first attack of the year, Major Samuel McColloch led a small force of men from Fort Vanmetre along Short Creek to assist the besieged Fort Henry. Separated from his men, McColloch was chased by attacking Indians. Upon his horse, McColloch charged up Wheeling Hill and made what is known as McColloch's Leap 300 feet (91 m) down its eastern side. In 1782, a native army along with British soldiers attempted to take Fort Henry. During this siege, Fort Henry's supply of ammunition was exhausted. The defenders decided to dispatch a man to secure more ammunition from the Zane homestead. Betty Zane volunteered for the dangerous task. During her departing run, she was heckled by both native and British soldiers. After reaching the Zane homestead, she gathered a tablecloth and filled it with gunpowder. During her return, she was fired upon but was uninjured. As a result of her heroism, Fort Henry remained in American control. The National Road arrived in Wheeling in 1818, linking the Ohio River to the Potomac River, and allowing goods from the Ohio Valley to flow through Wheeling and on to points east. As the endpoint of National Road, Wheeling became a gateway to early western expansion. In 1849 the Wheeling Suspension Bridge crossed the Ohio River and allowed the city to expand onto Wheeling Island. Lessons learned constructing the bridge were used in the construction of the Brooklyn Bridge. Rail transportation reached Wheeling in 1853 when the Baltimore and Ohio Railroad connected Wheeling to Pennsylvania, Maryland and markets in the Northeast. A bridge over the river connected it to Bellaire, Ohio and western areas. Much of this area had been settled by yeomen farmers, few of whom owned slaves. With the railroad, a larger industrial or mercantile middle-class developed that depended on free labor; it either felt disinterest or hostility to slavery. The Wheeling Intelligencer newspaper expressed the area's anti-secession sentiment as tensions rose over slavery and national issues. The city became part of the movement of western areas to secede from Virginia after the beginning of the Civil War. It was the location of the aforementioned Wheeling Convention. It served as the provisional capital of the Restored Government of Virginia from 1861 to 1863, and became the first capital of West Virginia after it seceded from Virginia and was admitted to the Union in its own right in 1863. The growing German population, which included immigrants after the 1848 Revolutions, was firmly anti-slavery. The Germans of Wheeling organized the "First West Virginia Artillery" to oppose the Confederacy and played a role in the initial movement to separate from Virginia. The Germans' culture influenced the city, such as their "German Singing Societies," the first of which began in 1855. Although Wheeling lost its position as capital in 1865, it continued to grow. In the late nineteenth century, it served as a prime industrial center for the state. Noted businesses of the era included the Bloch Brothers Tobacco Company and steel concerns. As it grew, prosperous residents built an area of fine housing around Wheeling Island, but slums also grew. With industry, Wheeling reached its peak of population in 1930. The Great Depression, and later changes and restructuring in heavy industry following World War II, led to a loss of working-class jobs and population. Capitalizing on its rich architectural heritage, Wheeling has worked to revive its main street and heritage tourism activities near the Ohio River. In addition, West Virginia has constructed fiber optics networks for advanced communication. Wheeling is becoming a center in health services and education as well. Wheeling is located at 40°4′13″N 80°41′55″W﻿ / ﻿40.07028, -80.69861 (40.070348, -80.698604). According to the United States Census Bureau, the city has a total area of 16.01 square miles (41.47 km2), of which 13.79 square miles (35.72 km2) is land and 2.22 square miles (5.75 km2) is water. Wheeling is located in northern West Virginia, on what is known as the northern panhandle. The area lies within the ecoregion of the Western Allegheny Plateau. The city is directly across the river from the state of Ohio and only 11 miles (18 km) west of Pennsylvania. It is a part of the Tri-State area of Ohio, Pennsylvania and West Virginia, which is commonly referred to as the Ohio River Valley Region or "The Ohio Valley". Wheeling Creek flows through the city, and meets the Ohio River in downtown Wheeling. The city is located both on the West Virginia side of the Ohio River, and on an island in the middle of the river called Wheeling Island. Wheeling lies on the transitional climate zone between the humid temperate climate and the humid continental climate (Köppen: Cfa/Dfa, respectively) with hot humid summers and cold winters. The annual precipitation is about 37 inches. As of the census of 2010, there were 28,486 people, 12,816 households, and 6,949 families residing in the city. The population density was 2,065.7 inhabitants per square mile (797.6 /km2). There were 14,661 housing units at an average density of 1,063.2 per square mile (410.5 /km2). The racial makeup of the city was 91.2% White, 5.1% African American, 0.2% Native American, 0.9% Asian, 0.2% from other races, and 2.4% from two or more races. Hispanic or Latino of any race were 0.9% of the population. There were 12,816 households of which 22.6% had children under the age of 18 living with them, 37.6% were married couples living together, 12.7% had a female householder with no husband present, 4.0% had a male householder with no wife present, and 45.8% were non-families. 40.4% of all households were made up of individuals and 17.5% had someone living alone who was 65 years of age or older. The average household size was 2.11 and the average family size was 2.84. The median age in the city was 45.2 years. 18.5% of residents were under the age of 18; 9.4% were between the ages of 18 and 24; 21.8% were from 25 to 44; 29.8% were from 45 to 64; and 20.6% were 65 years of age or older. The gender makeup of the city was 46.9% male and 53.1% female. According to the Huffington Post, Wheeling was named the sixth least diverse city in the United States. The website states that 94.2% of the city is White. African-Americans make up 3.1% of the city, and neither Hispanics or Asians make up even a full percent. As of the census of 2000, there were 31,419 people, 13,719 households, and 7,806 families residing in the city. The population density was 2,258.4 people per square mile (872.1/km²). There were 15,706 housing units at an average density of 1,128.9 per square mile (436.0/km²). The racial makeup of the city was 92.72% White, 4.99% African American, 0.10% Native American, 0.91% Asian, 0.03% Pacific Islander, 0.16% from other races, and 1.09% from two or more races. Hispanic or Latino of any race were 0.58% of the population. There were 13,719 households out of which 23.4% had children under the age of 18 living with them, 41.8% were married couples living together, 12.2% had a female householder with no husband present, and 43.1% were non-families. 38.3% of all households were made up of individuals and 18.6% had someone living alone who was 65 years of age or older. The average household size was 2.17 and the average family size was 2.89. In the city the population was spread out with 20.6% under the age of 18, 9.1% from 18 to 24, 24.3% from 25 to 44, 24.5% from 45 to 64, and 21.6% who were 65 years of age or older. The median age was 42 years. For every 100 females there were 84.1 males. For every 100 females age 18 and over, there were 79.6 males. The median income for a household in the city was $27,388, and the median income for a family was $38,708. Males had a median income of $30,750 versus $22,099 for females. The per capita income for the city was $17,923. About 13.1% of families and 18.0% of the population were below the poverty line, including 23.3% of those under age 18 and 11.2% of those age 65 or over. Under West Virginia law, cities may adopt the Manager-Mayor Plan. The elected mayor presides over meetings of the Wheeling City Council, which has six members elected from geographic wards. City Council members serve four-year terms. The City Council also confirms executive nominations for members to various boards which have limited regulatory authority, including the Planning Commission, the Board of Zoning Appeals, and the Traffic Commission. The City Manager serves as Chief Executive and Administrative officer for the city. The current Mayor of Wheeling is Andy McKenzie, and the current City Manager of Wheeling is Robert Herron. The current members of City Council are Gloria Delbrugge (1st Ward), Ken Imer (2nd Ward), Robert E. "Herk" Henry (3rd Ward), David Miller (4th Ward), Don Atkinson (5th Ward), and Vice-Mayor Eugene Fahey (6th Ward). City elections were held on May 8, 2012, and the current term began on July 1, 2012. City elections will be held again in 2016. The city of Wheeling has a rich and varied history. West Virginia Independence Hall was the site of the Wheeling Convention, two meetings held in 1861 that ultimately reversed Virginia's Ordinance of Secession. Twenty-six counties in Virginia's north and west voted against secession from the Union and created the new state of West Virginia, which the United States quickly admitted. Later in 1861 and continuing to 1863, the building was the site of many heated debates during the First Constitutional Convention of West Virginia including the name of the new state. Wheeling is home to Centre Market, formerly Wheeling's market house. Built in 1853, the market house and the surrounding area have been adapted for use as retail shops and restaurants. The first official memorial monument in the state of West Virginia, dedicated specifically to men killed in the Vietnam War, was dedicated in Wheeling, with full military honors, in a Memorial Day 1986 ceremony. The monument was erected in front of the flagpole near the main shelter of Bethlehem Community Park in the village of Bethlehem, just southeast of Wheeling. The roughly 6 foot tall granite memorial consists of a large, bronze dedication plaque with the names of KIAs from the Wheeling/Ohio County region. Below the dedication plaque is a bronze map of South Vietnam, complete with names of 28 major cities. Wheeling features several municipal parks including Oglebay Resort & Conference Center and Wheeling Park. Ohio County has six golf courses, including designs by renowned golfer Arnold Palmer and architect Robert Trent Jones. The Wheeling Suspension Bridge, which was once the longest suspension bridge in the world, connects downtown Wheeling to Wheeling Island. In October 2007 the City of Wheeling opened the state's first concrete skateboard park. The 12,000-square-foot (1,100 m2) facility was designed and built by world-renowned skatepark builder, Grindline, of Seattle, Washington. The park consists of 60% bowls and 40% street elements; it is located within the Chambers Ballfield Complex in the Elm Grove section of the City. An addition to the street section of the park was completed by Grindline in November 2009. A covered shelter, restrooms, and webcam are scheduled to be installed in early 2010. The park is lighted and open 24/7. As elsewhere in West Virginia, K–12 schools are organized at the county level of government. The public school system, Ohio County Schools, consists of 14 schools: nine elementary schools, four middle schools, which include Triadelphia Middle which has been nominated for the blue ribbon school award; and the nationally recognized Wheeling Park High School. Several parochial and private schools, including Wheeling Central Catholic High School and the Linsly School, are located in the city. Wheeling is the hub of higher education in the Northern Panhandle of West Virginia. Wheeling Jesuit University, a private Jesuit university and the only Catholic college in the state of West Virginia, is located here. The main campus of West Virginia Northern Community College has recently been expanding with centers in downtown Wheeling; it focuses on job training and community development. Also located within close proximity to the city are West Liberty University (formerly West Liberty State College), a four-year university, and private Bethany College, giving area residents a wide variety of educational options. Wheeling has a long tradition of live musical performance and radio broadcasting. With over 2,500 seats, The Capitol Theatre is the largest theatre in West Virginia. Opened in 1928, The Capitol was home to It's Wheeling Steel, a popular radio program in the early forties featuring musical performances by workers at a local steel plant. The Capitol welcomes musical performances of all types, from Johnny Cash, Merle Haggard, and Tammy Wynette, to Ray Charles, Bob Dylan, B.B. King and Black Sabbath. Other past performers include Jerry Seinfeld, David Copperfield, and George Carlin. The Wheeling Symphony Orchestra is housed at the Capitol Theatre and performs a range of contemporary, classical, and seasonal arrangements. Wheeling is also home to the Victoria Theater, the oldest theater in West Virginia. The 700-seat Victorian-style theater served as home to the WWVA Jamboree program from 1933–1936. More recently, it has been the site for the "Wheeling Jamboree", a local initiative started in 2009 and modeled after the original WWVA Jamboree (which changed its name in the 1960s to Jamboree U.S.A.). 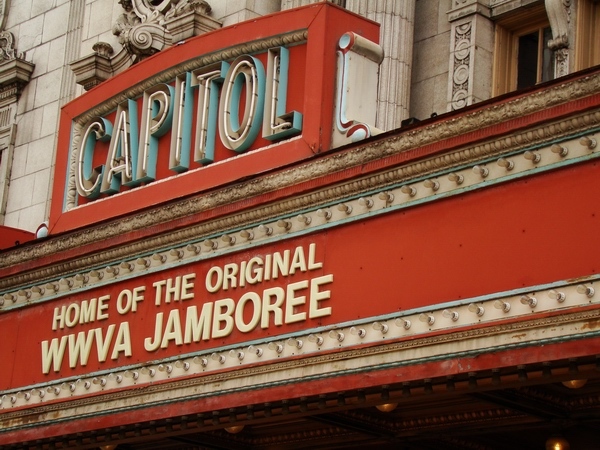 The original WWVA Jamboree ran from 1933–2007, making it the second longest running country radio program and a variety show in the country after the "Grand Ole Opry" in Nashville, Tennessee. Live music echoes from the amphitheatre at the Wheeling Heritage Port several nights per week from mid-Spring through late-Fall. The waterfront park area hosts numerous festivals, concerts, movie nights, celebrations, a regatta and numerous visits from the Delta, Mississippi and American Queen riverboats. The Port holds over 8,000 spectators and has become a focal point to the City. Held in nearby Belmont County, Ohio Jamboree In The Hills draws over 100,000 country music fans to the Wheeling area every July. Fans of theater have several options in Wheeling. The Capitol Theatre hosts numerous touring musical performances. In addition, the Oglebay Institute's Towngate Theatre in Center Wheeling has, for over 35 years, produced plays. Located across the street is the Independent Theatre Collective, which performs at the former Second Presbyterian Church. Wheeling is home to the Wheeling Nailers hockey team. The Nailers play in the WesBanco Arena (formerly the Wheeling Civic Center), and participate in the North division, American Conference of the ECHL. High school football and soccer are played at Wheeling Island Stadium. Formerly home to the Ohio Valley Greyhounds, Wheeling became home to a second team in 2009. The team, known as the Wheeling Wildcats, played in the Continental Indoor Football League but folded after the 2009 season. Wheeling is also home to the headquarters of the Mountain East Conference, a NCAA Division II conference that plans to start play in the 2013–14 school year. Wheeling Jesuit and West Liberty are both charter members of the new conference, an offshoot of the disbanding West Virginia Intercollegiate Athletic Conference. Wheeling is the home of Wheeling Island Hotel-Casino-Racetrack located on Wheeling Island. Formerly known as Wheeling Downs, the facility features live greyhound racing, slots, poker games, and casino-style table games. In accordance with House Bill 271 adopted on March 8, 2007, Ohio County and Jefferson County held special elections on June 9, 2007, to approve the legalization of table games within the respective counties. The Ohio County measure passed, but the Jefferson County one failed. A similar measure was successfully adopted in Hancock County on June 30, 2007. Due to its close proximity to Pittsburgh, Wheeling is heavily influenced by that city's broadcast media outlets, which are easily received in the area. Besides broadcast stations Wheeling's cable providers also carry Root Sports Pittsburgh and the Pittsburgh-centric news/talk channel PCNC as its "home" sports and information sources. In addition to the Pittsburgh outlets, the Wheeling television market is served by CBS affiliate WTRF-TV Channel 7, PBS affiliate W41AA Channel 41, and NBC affiliate WTOV-TV Channel 9 in nearby Steubenville, Ohio. The city is served by cable television provider Comcast and parts of the city are also served by Centre TV. Wheeling is home to WWVA 1170 AM, the state's only 50,000-watt AM station that can be heard throughout the East Coast at night. WVLY 1370 AM and WKKX 1600 AM provide local news, sports, and talk. On the FM dial, WVKF 95.7, WKWK 97.3, WOVK 98.7 and WEGW 107.5 provide the area with various music genres. The Wheeling area is the home of WDUQ-LP, a listener-supported commercial-free station, which also serves as the local Pacifica affiliate. Pittsburgh's radio stations provide Wheeling with coverage. A number of translators and repeater stations provide NPR and American Family Radio networks. Wheeling also has a student-run radio station, WPHP 91.9, operated by Wheeling Park High School students. WPHP plays top 40 songs and also covers all of the Wheeling Park Patriots' football and basketball games. The city is home to The Intelligencer and Wheeling News-Register newspapers. Both papers are owned by Ogden Newspapers Inc., based in Wheeling. The Intelligencer is published weekday mornings and Saturdays, while the News-Register is published weekday afternoons and Sundays. The Times-Leader of Martins Ferry, Ohio, another Ogden Newspapers Inc. paper, also covers Wheeling issues. In Wheeling magazine is published quarterly and covers society and events in the city. Interstate 70 and its spur Interstate 470 run through the city east-west and link it with suburban Pittsburgh, Pennsylvania to the east and Ohio to the west. U.S. Route 40/National Road links downtown with residential neighborhoods to the east. West Virginia Route 2 connects Wheeling with Moundsville to the south and Weirton to the north. U.S. Route 250 also runs through the city. The Fort Henry Bridge and Vietnam Veterans Memorial Bridge carry I-70 and I-470 respectively over the Ohio River. The historic Wheeling Suspension Bridge, completed in 1849, which was part of National Road (see early pic. ), now carries cars and light trucks as well as pedestrian traffic between downtown and Wheeling Island. I-70 passes under Wheeling Hill through the Wheeling Tunnel. Bus transportation to points throughout North America is available from Wheeling through Greyhound Lines. The bus terminal, the Robert C. Byrd Intermodal Transportation Center, was built with $11.1 million in federal funds. Regional transportation through West Virginia and Eastern Ohio is provided by the East Ohio and Ohio Valley Regional Transit Authorities, which shares the Intermodal Transportation Center as its hub for its Hub-and-Spoke routes throughout the area. Wheeling once operated streetcars from the 1880s to 1943 under the Wheeling Traction Company and Co-operative Transit Company. Buses replaced streetcar operations due to operating costs. The city is served by the Wheeling Ohio County Airport for general aviation and Pittsburgh International Airport for passenger service. In Season 1 of The White Shadow, the episode "Bonus Baby" has the Wheeling Wheelers as the semi-pro team that Warren Coolidge was being shopped to by unscrupulous agent, Walter Preston. Wheeling, under the name Raysburg, occurs again and again as the centre for action in several of Keith Maillard's novels, notably in Gloria and Clarinet Polka. In the 2005 film Walk the Line, Johnny Cash and June Carter performed at the Capital City Music Hall in downtown Wheeling while on tour. Wheeling is referred to in Bat Boy: The Musical as the nearest large town to Hope Falls, where the story takes place. Wheeling is referred to in the episode "Howard and Millie" of The Andy Griffith Show, where the couple, along with Andy and Helen, travel by train to Wheeling to get married. The wedding is then cancelled after arriving. Wheeling is referred to in an episode of The Waltons, called "The Deed", set in and around Schuyler, Virginia, when Richard Thomas' character "John Boy" travels 335 miles (539 km) to the 'Big City' of Wheeling in 1934. Wheeling is referred to in an episode of the sitcom Family Ties, set in Columbus, Ohio, when Michael J. Fox's character Alex P. Keaton says, "let's go down to Wheeling, West Virginia," to drink. Billy Joel's hit song "The Ballad of Billy the Kid" identifies the birthplace of the ballad's antagonist as Wheeling. In Season 2 of The West Wing, the episode "In This White House" names Wheeling as a location where two would-be assassins purchased firearms in their mission to kill the show's President, Josiah Bartlett. John Corbett's character, Chris Stevens (Chris in the Morning), in Northern Exposure is from Wheeling. "Life in the Iron Mills", a short story by Rebecca Harding Davis, was set in the factory world of nineteenth-century Wheeling. Her first published work, it appeared anonymously in April 1861 in the Atlantic Monthly; it caused a literary sensation and its powerful naturalism. Whatever is a 1998 independent film, shot mostly in Wheeling, about teenagers facing the difficulties of growing up in Northern New Jersey. A West Virginia–centric episode of Murder, She Wrote, "Coal Miner's Slaughter", has Megan Mullally's character passing the bar exam in Wheeling. "Wheeling, West Virginia" was a hit song for Neil Sedaka in 1970. The song tells of an actor from Wheeling who works at MGM. "Eliza and the House that Jack Built", a novel by Hungarian writer Albert Wass, takes place in the Wheeling area, around the end of the 19th century. The story is about the pioneers and immigrants who have settled there. Fort Wheeling, a comics series by the Italian comics author Hugo Pratt, deals with events taking place in the Wheeling area during the American Revolution. Barney Stinson (Neil Patrick Harris) mentions Wheeling in an episode of How I Met Your Mother, aired November 4, 2013. ^ "Population Estimates". United States Census Bureau. http://www.census.gov/popest/data/cities/totals/2013/SUB-EST2013-3.html. Retrieved 2014-07-08. ^ Sullivan, Ken, ed (2006) . The West Virginia Encyclopedia. West Virginia Humanities Council. ISBN 0-9778498-0-5. ^ a b Cranmer, Hon. Gibson Lamb., ed (1902) . History of Wheeling City and Ohio County, West Virginia and Representative Citizens. Chicago: Biographical Publishing Company. ^ Health and Environmental Effects Research Laboratory "Level III Ecoregions of West Virginia". U.S. Environmental Protection Agency. http://www.hort.purdue.edu/newcrop/cropmap/wvirginia/maps/WVeco3.html Health and Environmental Effects Research Laboratory. Retrieved 29 September 2013. ^ "Annual Estimates of the Resident Population: April 1, 2010 to July 1, 2013". http://www.census.gov/popest/data/cities/totals/2013/SUB-EST2013-3.html. Retrieved July 8, 2014. ^ Anderson, Jessica (September 7, 2012). "The Most And Least Diverse Cities In The U.S". Huffington Post. http://www.huffingtonpost.com/2012/09/07/most-least-diverse-cities-brown-university-study_n_1865715.html#slide=1490307. ^ Waterson, Steve. "Reopening of Centre Market today," Wheeling Intelligencer, 18 May 1989, accessed 13 Apr 2008 . ^ "The Value of a Jesuit education." Wheeling Jesuit University, accessed 13 Apr 2008 . ^ Hughes, Mike. "Indoor Football Returning to Wheeling." Wheeling Intelligencer 15 Mar 2008 13 Apr 2008 . ^ In Wheeling Magazine, IN Publishing, LLC. 27 Dec 2008 <http://www.inwheelingmagazine.com/>. ^ "Byrd Bucks Brought to W.VA.." Wheeling Intelligencer 29 Nov 2008 9 Jan 2009 <http://www.theintelligencer.net/page/content.detail/id/517737.html?nav=510>. ^ "Getting Around." The City of Wheeling, West Virginia. 2009. Wheeling, WV. 9 Jan 2009 <http://wheelingwv.gov/aboutwheeling.php?id=63>. ^ "Joseph M. Devine". National Governors Association. http://www.nga.org/cms/home/governors/past-governors-bios/page_north_dakota/col2-content/main-content-list/title_devine_joseph.html. Retrieved 13 September 2012. Duffy, Sean, & Rinkes, Paul, Wheeling: Then & Now. Mount Pleasant, S. Carolina: Arcadia Publishing, 2010. Fones-Wolf, Ken, “‘Traitors in Wheeling’: Secessionism in an Appalachian Unionist City,” Journal of Appalachian Studies, 13 (Spring–Fall 2007), 75–95. Minder, Mike. Wheeling’s Gambling History to 1976. Wheeling: Nail City Publishing, 1997. "Ohio River: Wheeling". James' River Guide ... Mississippi Valley. Cincinnati: U.P. James. 1871. http://archive.org/stream/jamessriverguide00jame#page/n99/mode/2up. Schramm, Robert W. The Linsly School. Mount Pleasant, S. Carolina: Arcadia Publishing, 2003. "Wheeling". Commercial Directory of the Western States. St. Louis: Richard Edwards. 1867. http://books.google.com/books?id=xFs2AQAAMAAJ&pg=PA975. Wikisource has the text of the Encyclopaedia Britannica (9th ed.) article Wheeling. This page uses content from the English language Wikipedia. The original content was at Wheeling, West Virginia. The list of authors can be seen in the page history. As with this Familypedia wiki, the content of Wikipedia is available under the Creative Commons License.